Instant Pot Swedish Meatballs–a mixture of ground beef and pork are seasoned well and formed into meatballs and then cooked quickly in your pressure cooker. A creamy gravy smothers the meatballs for a delicious dinner you’d love to have any day of the week. Swedish meatballs are just one of those things that you should have more often than just the times that you shop at IKEA. 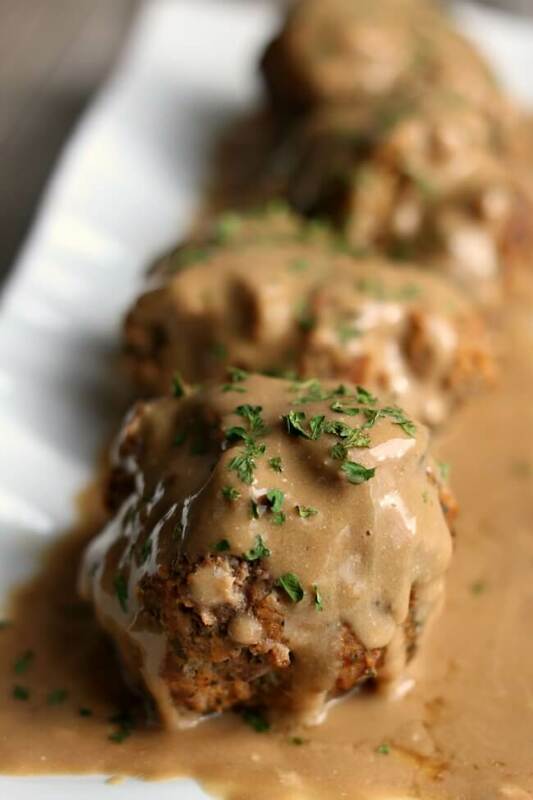 They are well seasoned meatballs with a creamy gravy sauce…what could be better? Well actually, I think that adding in mushrooms to the gravy would make them better but that’s beside the point. I took a basic swedish meatball recipe that I found on Taste of Home and tweaked it to my liking and transformed it into an Instant Pot recipe. My husband was loving this after he got home from work and kept saying, “these are so good! !” You can serve these over egg noodles or mashed potatoes or just straight up. It’s up to you. To make Instant Pot Swedish Meatballs I used my 6 quart Instant Pot Duo 60 7 in 1*. I love this Instant Pot because it has the yogurt making function which I use almost weekly. It has two pressure settings (high and low), and there are also little slots in the handles so that you can rest the lid there instead of putting it down on your counter-top. 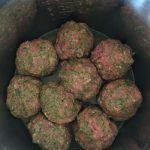 Ground beef and pork sausage are seasoned well and formed into meatballs and then cooked quickly in your pressure cooker. A creamy gravy smothers the meatballs for a delicious dinner you’d love to have any day of the week. Pour 1 cup of beef broth into the bottom of your Instant Pot. Shape the meat mixture into meatballs and place in the bottom of the pot. I formed mine fairly large and there were 9. If you need to you can stack them on top of each other. Cover the pot and secure the lid. Make sure valve is set to sealing. Set the manual/pressure cook button to 5 minutes on high pressure. After the time is up, let the pressure release naturally for 10 minutes and then move the valve to venting. Carefully scoop the meatballs on to a platter and tent with foil. Turn your Instant Pot to the saute setting and whisk in the package of gravy mix. Whisk well. Bring it to a boil and stir for 1 minute. Remove the inner pot from the Instant Pot and set on the counter for a couple minutes and then stir in 1/2 cup of sour cream. (If you try to stir in the sour cream when it is ultra hot it will curdle). Season to taste. 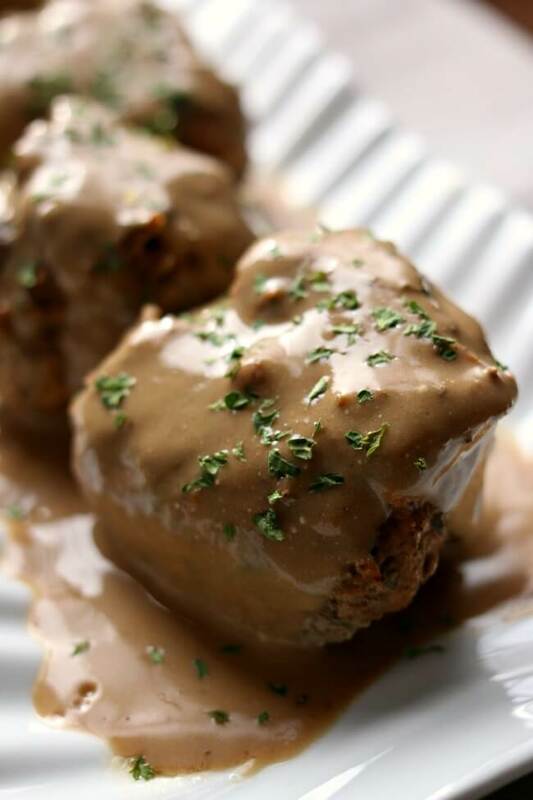 Serve gravy over the top of meatballs. Enjoy! This makes 9 large meatballs. You can also make a smaller size and stack them on top of each other. Like this recipe for Instant Pot Swedish Meatballs? Get all my new recipes delivered to your email inbox by signing up below. 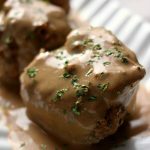 I want to make your Homemade Gravy Mix.It appears to make two recipes of gravy, if I am calculating correctly, about 2 Cups each. I don’t buy Beef bullion granules, but use Better Than paste. Maybe I could stir in the beef paste when the other ingredients are added to the liquid? I think will work just as well. What do you think? That sounds like a good plan. I bet it will work! can you add potatoes in the pot along with the meatballs? I bet that would be great. Because it’s a five minute cooking time I would quarter them or cut into chunks. These were so good! They were tender and so flavorful. I used garlic seasoned bread crumbs. I would suggest doubling the gravy if using a gravy packet. I will be making these again for sure! So glad you liked them Dawn! Made this for the family tonight (kids 1,3,10). The 3 year old said they were too flavorful for her but everyone else loved them! Kids had with mashed potatoes. Me and hubby with salad. Super delicious! I didn’t add the sour cream because I hate sour cream but OMG these were AMAZING! Over mashed potatoes with green beans. Delicious! I used 1lb of hamburger (omitting the pork since I didn’t have any thawed). Therefore I halved the meatball ingredients but kept the sauce ingredients the same. Very good! It was a hit with my husband and kids. Served over pasta. Absolutely delish! Your meatballs must have been HUGE! I ended up with 16, lol. Not a problem though. I made them in advance anyway so I froze them all and made 8 of them from frozen tonight. I added a minute to the cook time and they were perfect. And now I have a second night’s meal in the freezer ready to go! Well that will be convenient on a busy day! Nice! Just made these and they are absolutely delicious! The only thing I did differently was add sliced cremini mushrooms to the liquid before adding the meatballs ( had in fridge and needed to use them) and I added a half a bay leave since I but a bay leaf in almost everything. Yum! The mushrooms sound fantastic! You are awesome. I can’t wait to get on here and see what”s next. All of your recipes are wonderful. Thank you sooooo much. I am new to the pressure cooker world and you have been a great help. Your daughter is beautiful and will be a great cook like her mother. You are a blessing. This was such a sweet comment to read. Thank you so much! My family really enjoyed this meal. We had left over potatoes but I also cooked a small amount of egg noodles for another option. I didn’t have pork so I used 2.4 pounds of ground beef. I also used a homemade gravy mix recipe. Thank you for sharing! This is great, I will make this a lot. Made this recipe last night, came out really well! Have leftovers going to try it over mashed instead of pasta. Thanks! Here is a homemade gravy mix that I make. Does that help? 1. Run all the ingredients through a blender or food processor. Pulse about 10 times until all the granules are the same consistency. Store in an airtight container. 2. To make gravy, mix 1/4 cup of mix with 2 cups of milk or water in a saucepan. Whisk over medium heat until smooth and it thickens. I was so going to make this until I saw the packaged gravy mix, but started to read the comments. Low and behold, I saw your recipe for home-made gravy mix! Thank you, btw, I LOVE my pressure cooker! Hi! Could I use all beef you think? I think that would work just great!